Learning to play golf is one of the great challenges in all of sports. Learning the game’s golf terms and lingo may be just as difficult. Golf Terms: Birdie. Bogey. Mulligan. Golf Club Fitting. Golf Terms: Slice. Hook. Shank. Golf Terms: Drivers. Wedge. Hybrid. What’s a newbie to make of all these baffling golf terms? Heck, even veteran golfers are sometimes stumped by the language that pops up on the course. There’s one set of words and phrases covering the swing (address, backswing, follow-through), another describing results (fade, draw, fat), still another devoted to different types of shots (chip, pitch, bump-and-run). Then there’s the golf course (fairway, green, bunker) and equipment (putter, perimeter weighting, center of gravity). You’ve got to know golf’s basic rules (out of bounds, penalty stroke, ground under repair) and its byzantine etiquette practices (honors, away, marking your ball). And you can’t walk a yard on a golf course without hearing a few slang terms (19th hole, chicken wing, sandy) or statistical talk (green in regulation, up-and-down). That, friends, is merely the tip of a massive linguistic iceberg. When learning any new language, total immersion in the culture is the best way to go. By playing and practicing often, hanging around the clubhouse, talking to other golfers and watching golf on TV, you’ll pick up the lingo lickety-split. 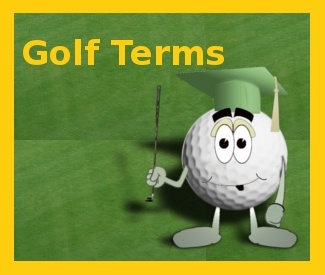 If your golf time is limited, however, you’ll find the Golf-Info-Guide.com Golf Terms Glossary a terrific resource for boning up. Before long, you’ll be slinging golf slang like an old pro. On those occasions when you hear a new golf term, dial up this page and scroll down. You’ll probably find it here. We’re constantly expanding our own vocabulary, adding words and phrases to help all golfers – from novices to old hands – better understand this perplexing game. Please find below a glossary of golf terms. A dictionary with definitions, and golf terminology of the most popular golf jargon terms used by other golfers, golf web sites, and golf videos.